Генера́льный секрета́рь НА́ТО является главным должностным лицом Организации Североатлантического договора (НАТО). Генеральный секретарь отвечает за общую координацию работы альянса, а также является главой Североатлантического совета. ↑ Стиккер ушел с поста годом ранее в связи с ухудшением состояния здоровья. ↑ 1 2 Worner died in office on August 13, 1994 of cancer. The Deputy Secretary General, Sergio Balanzino, took over his daily responsibilities for the last several months on his life and then became исполняющий обязанности Secretary General upon his death until the appointment of Willy Claes. ↑ 1 2 Claes resigned as Secretary General after a bribery scandal, centering on his actions in the Belgian cabinet in the 1980s. After his resignation, Deputy Secretary General Sergio Balanzino served as исполняющий обязанности Secretary General until the appointment of Javier Solana. ↑ George Robertson announced in January 2003 that he would be stepping down in December. Jaap de Hoop Scheffer was selected as his successor, but could not assume the office until January 2004 because of his commitment in the Dutch Parliament. Robertson was asked to extend his term until Scheffer was ready, but declined, so Minuto-Rizzo, the Deputy Secretary General, took over in the interim. ↑ Scheffer was named Secretary General of NATO effective January 1, 2004, but he did not take office until January 5, 2004. ↑ Cook, Don. Resignation announced by Stikker, The Washington Post (April 3, 1964). ↑ Marshall, Andrew. Hunt is on to find new Nato chief, The Independent (15 August 1994). Дата обращения 29 марта 2009. ↑ Whitney, Craig. Facing Charges, NATO Head Steps Down, The New York Times (21 October 1995). Дата обращения 29 марта 2009. ↑ Smith, Craig. NATO Secretary General to Leave His Post in December After 4 лет, The New York Times (January 23, 2003). Дата обращения 29 марта 2009. ↑ Jaap de Hoop Scheffer, Newsmakers, Thomson Gale (January 1, 2005). ↑ 1 2 NATO Chief Steps Down, The New York Times (December 18, 2003). Дата обращения 29 марта 2009. ↑ Crouch, Gregory. NATO Names a Dutchman To Be Its Secretary General, The New York Times (23 September 2003). Дата обращения 29 марта 2009. ↑ Crouch, Gregory. New NATO Chief Takes Over, The New York Times (January 6, 2004). Дата обращения 29 марта 2009. 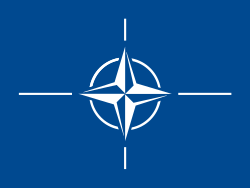 ↑ The extension of the Secretary General's mandate, NATO (October 3, 2012). Дата обращения 27 августа 2013. Эта страница в последний раз была отредактирована 29 сентября 2017 в 15:21.